There are 100 things to think about when selecting a sofa – from seat height to cushion fill and from welts to seam stitching. There’s also the shape, the pitch of the back, the arm height and leg design, shape and color. And of course, you must consider how all of these elements fit into the overall design of the space. With so many variables to consider, where do you start? Comfort is paramount, so select the construction of the cushions and pillows. Firm cushions are usually made of foam, while the softest sofas will be 100 percent down. The sweet spot for most people is somewhere in the middle – Alex likes to target an 80/20 down-to-foam mix. The angle of the sofa’s back, the cushion dimensions and the height and size of the arms are a combination of style and comfort choices you must make as well. Think about how you like to sit on a sofa and its primary function: General lounging or more formal socializing? Sunday afternoon napping or hosting game nights? 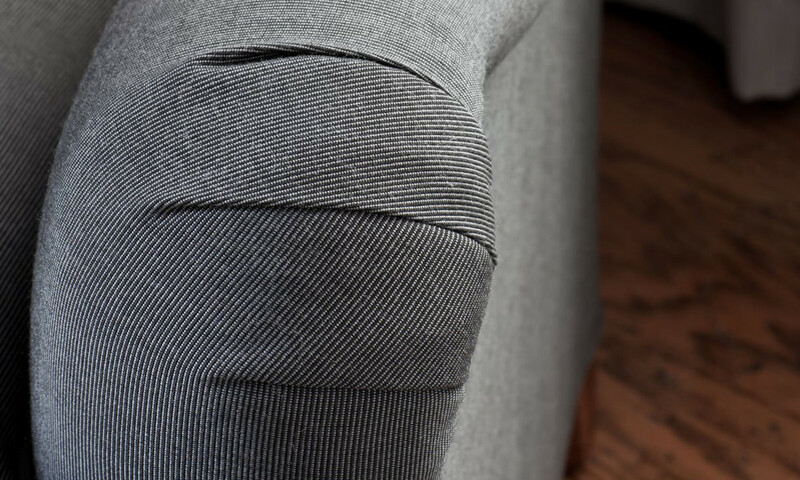 Look next to welts, the finishing touch that covers the seams of the sofa. Welts can be made of cord, fringe or simply be a style of stitching. They can match the fabric color or be a point of contrast, depending on the look you are trying to achieve. If welts made of cord aren’t your style, consider saddle stitching for the seams, as Alex did for our living room sofa. Similar to the stitch on a baseball seam, saddle stitching provides a clean, tailored look. Beyond all the variables that help determine what fabric should go on a sofa, you also have to consider function. For example, you may not want to choose a delicate fabric that doesn’t fit the function of the space, even though it’s a perfect match for the form. Confused? Think about it this way: If you have a house full of kids and pets, durable fabrics are a must. If the room gets an abundance of natural light, UV-resistance should be at the top of your list. There’s a time and a place for off-the-shelf retail furniture and a time and a place for custom made furniture. Ask questions of the salesperson to gauge their understanding. They can help you find the sofa that you’re the most attracted to and build it in a way that accommodates the aesthetic you desire. Changing the size, style or fabric could mean the difference between a sofa you consider just OK and a sofa that’s perfect for your home. And, if you don’t see something you love on the showroom floor, don’t be afraid to look in furniture manufacturer catalogs – like Alex, that may be where you find the perfect sofa. Tell us about your quest for the perfect sofa. How long did it take before you found it? What characteristics are important to you? Share your design experiences with us via Instagram @Sunbrellafabric #perspectiveATL or leave us a comment.